A high-quality natural environment conveys a sense of wellbeing and satisfaction to a country’s population through characteristics that may be physical (such as air quality), social (such as green areas in which to meet) or symbolic (such as national parks). 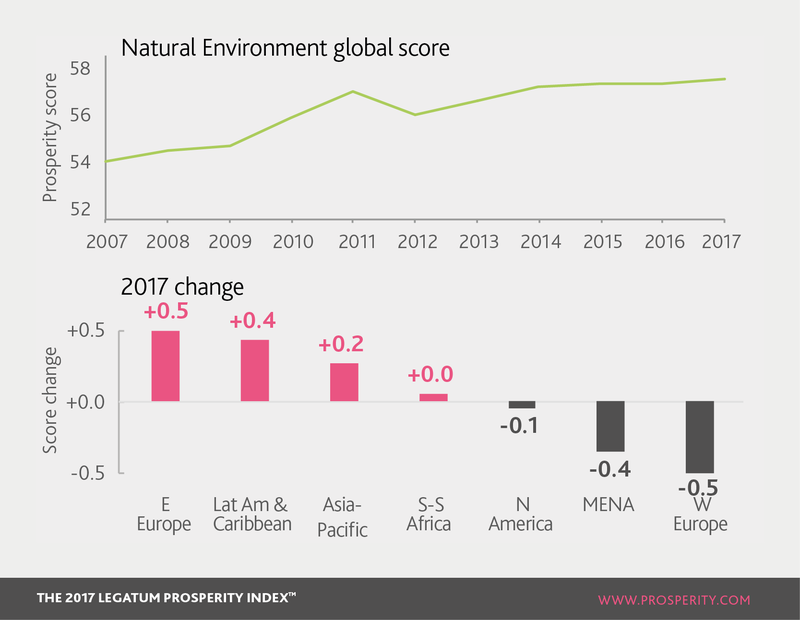 Natural Environment has improved in every year of the Index except 2012, with the greatest gain over the last decade coming through wider access to drinking water. Eastern Europe gained the most in 2017, coming from more sustainable use of freshwater, along with increased satisfaction with governments’ preservation efforts. However, some indicators have worsened across the world. Water supplies (as measured by freshwater withdrawal), along with fish stocks, are now more stressed than they were in 2007. Environmental Quality looks at the extent to which the natural environment enhances human welfare. Attributes of environmental quality such as clean air and water bring immediate health and wellbeing benefits. Eastern Europe improved its environmental quality more than any other region in the last decade, through reductions in air pollution. The world’s fastest 12 improving nations for air quality since 2007 are all Eastern European, led by Ukraine. China meanwhile has the worst air pollution in the world, and sits second bottom in this sub-pillar, just above Bangladesh. Environmental Pressures measures the exploitation of natural resources. Over-exploitation can restrict the ability of the natural environment to support biodiversity. Sustainable agriculture and fisheries can increase long-run productivity through the slowing of degradation, which acts as a long-run drag on productivity. Out of the top five countries that have improved the most in the last five years on Environmental Pressures, four are from Eastern Europe: Moldova, Lithuania, Ukraine and Hungary. Russia considerably improved the sustainability of its fish stocks in the last decade, making it the fastest riser in this sub-pillar. Despite being in the top 10 for overall prosperity, the Netherlands ranks 149th in the world for environmental pressures, due to stressed fish stocks and high freshwater withdrawal. Preservation Efforts measures how well countries take steps to preserve and protect the natural environment. This includes the extent to which they avoid contamination of the environment through pollution (such as wastewater or pesticides). Western Europe improved the most in the last decade among the world’s regions through improved treatment of wastewater and reduced air pollution. Slovenia improved the most in this sub-pillar since 2007, as the nation moved to protect almost 100% of its territorial waters. In the last 10 years, Indonesia saw the largest increase in people saying they were satisfied with preservation efforts.